DURHAM, Ontario – Durham Furniture will add a modern European-inspired touch to its assortment with the addition of the Odyssey bedroom and occasional collection at the upcoming fall edition of the High Point Market (HPM). Constructed of solid clean maple, the cases in the 14-piece collection featured recessed steel bases in a matte black finish and matching streamlined hardware. It will be shown in several of the solid wood specialist’s 50 available finishes to demonstrate the wide variety of looks that can be achieved by the custom finishing techniques it has become known for. One of the finishes on offer at HPM will be a natural finish with no pigment – just sealer and lacquer – which will highlight the natural beauty of solid maple and spotlight the modern design elements that are new to the Durham line. The Odyssey collection is headlined by a pair of panel beds – one utilising wood panels and a second featuring an upholstered panel. The panels mimic the relief design prevalent on the drawers of the case pieces and the wood grain runs vertically to visually heighten the bed and make a more dramatic statement. The standout dressing chest has three graduated drawers and a door storage compartment with an adjustable shelf above two wider bottom drawers. The lingerie chest has a similar design, with three graduated drawers at the bottom, topped off with a door storage compartment with an adjustable shelf. The recessed steel bases and refined scaling of the case pieces allow for versatile placement to create multiple configurations to suit the needs of the consumer. 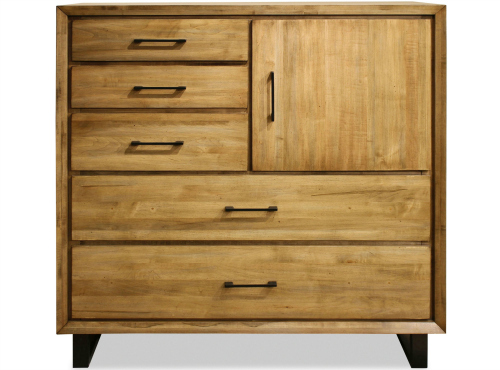 Most case pieces in the collection have soft-close drawers and cedar-lined bottom drawers. The five-piece occasional line-up, which utilizes the same metal base as the bedroom case pieces, is headlined by a cocktail table with an octagonal top, two storage drawers and an open lower shelf. Scaled for a larger room, the shape coordinates well with larger upholstered pieces. Other occasional pieces include a rectangular cocktail table with one drawer, a square end table with an open shelf and beveled face frames on both sides – allowing it to float in any part of a room – a rectangular end table with similar features and a 45-inch multi-functional console table that can house media components and accommodate a flat screen TV or be used as a sofa table or display piece. The Durham showroom is in space G-1082, on the tenth floor of the International Home Furnishings Center. The fall edition of the High Point Market opens for its five-day run on 13 October 2018.